Finger limpets, small gastropods common on the shores of the U.S. Pacific coast, are creatures of two worlds. They like hot sun and cold water, and live their lives mostly on rocks or piggybacked on other creatures with similar preferences, such as mussels, riding out the ebb and tide of the ocean. A limpet can move about quite a bit, and its strong gastropodal foot can keep it firmly fastened to a rock even under the force of a strong wave, but as it turns out, what they can’t do is tolerate large variations in air temperature. 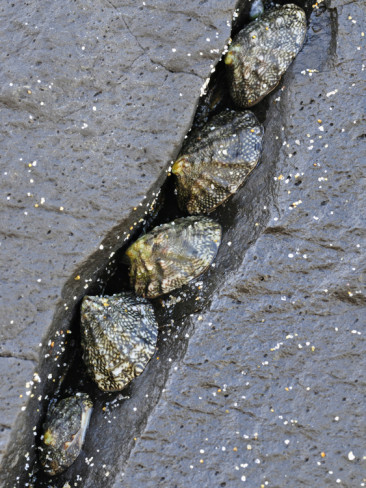 A recent study in the Journal of Experimental Biology – Thermal physiology of the fingered limpet Lottia digitalis under emersion and immersion – showed that while limpets might look like they are tenaciously attached to an intertidal rock face, their grip on survival might not be quite as strong as it appears. They aren’t able to adapt to rising temperatures while exposed to the air (’emersion’), and their comfort zone is relatively narrow. ‘Clinging like a limpet’ might take on a new meaning when it comes to climate change adaptability. These marine snails can act as a barometer for the effect of an increasing number of warmer-than-average days on tidal species.